The provider must communicate and collaborate with CPE activity faculty regarding the identified educational needs, intended audience, objectives, active participation, and learning assessments for each CPE activity. The provider must assure that all CPE activities include active participation and involvement of the pharmacist and technician. 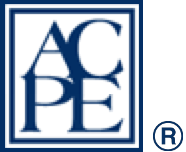 The provider must offer educational materials for each CPE activity that will enhance participants’ understanding of the content and foster applications to pharmacy practice. Please log in or register a new account to access this webinar.